Tamarisk, also called salt cedar, common name for a genus of deep-rooted, deciduous trees and shrubs native from the Mediterranean region to northern China. Several species are grown as seashore windbreaks and others as ornamentals. Some have important medicinal properties, and still others are cultivated for their dye products. Scientific classification: Tamarisks make up the genus Tamarix of the family Tamaricaceae. 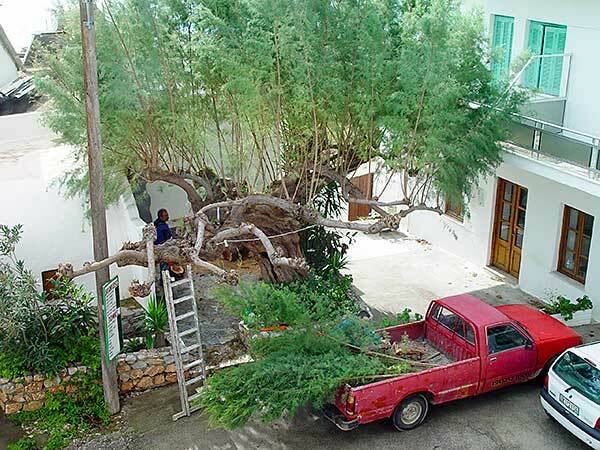 Tree typical of the river systems of the lowland and coastal areas, where it tolerates harsh arid and saline conditions. 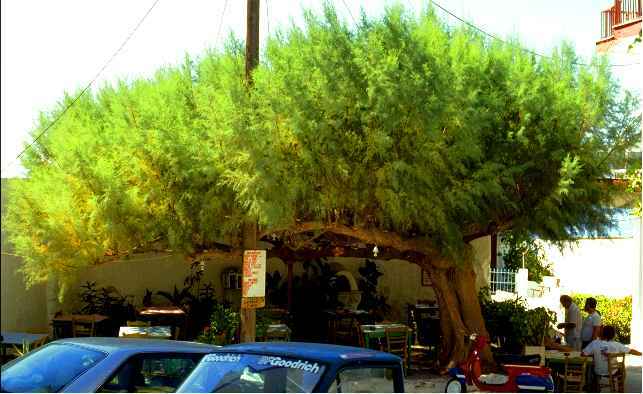 It is due to this tolerance that the tamarisk is often considered as one of the trees which is most characteristic of the Cretan shores. With a height of rarely more than 5-6 m, and sometimes found in bush form, this species is recognised by its small leaves growing on very thin branches, which give the tree a permanently stringy look, and on occasions seems as if it has died. The flowers form in soft, reddish-brown racemes in spring. Tamarisk offers splendid light shadow and functions as a natural umbrella. The plant genus Tamarix is comprised of about 54 species native to North Africa, the Mediterranean, and the Middle East. Popularly called "tamarisk" or "salt cedar," it usually grows as a woody shrub or small tree in areas where water is at or near the surface. 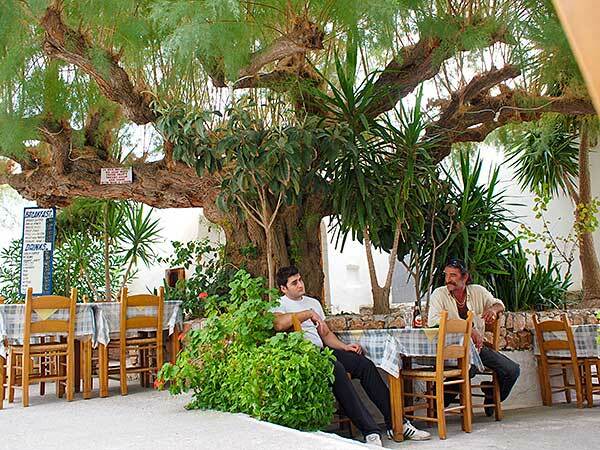 We at Hotel Stavris, Chora Sfakion, Crete, are very lucky to have one very old Tamarisk just in front of our Hotel. It offers perfect shade to our pavement café, without taking away all the light of the sun. It brings a very nice atmosphere to our place and we are happy that our Tamarisk grew its roots through 80 meters of rocks just down to the harbour, where it gets its salty water right from the Libyan Sea. Unfortunately its roots cracked the walls of the old telephone office. So, the office had to be rebuilt elsewhere and the tree survived! Our Tamarisk (Tamarix parviflora) is about 6 meters high and considered as huge, spanning more than 25 meters. Every year in the beginning of December we are pruning all small branches of our tamarisk, to prevent it from becoming too large. Thanks to the fertile ground and good climate these all grow back soon, and end of April the tree is back to what it used to be, now with fresh green tiny leaves. You can find some more pictures here. Tamarisk is distinguished by its feathery, needle-like leaves and numerous small, white or pink flowers at the end of the branches. Up to 500,000 small, windblown seeds can be produced per plant. The tamarisk is highly adapted to arid climates. It thrives in very saline and nutrient-poor soil. During the spring it can grow as much as one foot per month. It spreads readily by seed and by root, trunk, and branch sprouts. Tamarisk can usually out-compete native plants for water. A single, large tamarisk can transpire up to 1100 liters of water per day. In many areas where watercourses are small or intermittent and tamarisk has taken hold, it can severely limit the available water, or even dry up a water source. Tamarisk can grow in salty soil because it can eliminate excess salt from the tips of its leaves. When the leaves are shed, this salt increases the salinity of the soil, further reducing the ability of native plants to compete. Because of its ability to spread, its hardiness, its high water consumption, and its tendency to increase the salinity of the soil around it, the tamarisk has often completely displaced native plants in wetland areas. From a wildlife point of view, the tamarisk has little value and is usually considered detrimental to native animals. The leaves, twigs and seeds are extremely low in nutrients, and, as a result, very few insects or wildlife will use them. And this will benefit the absence of insects, like mosquitos, to our guests. Around many temples in Ancient Egypt there were sacred lakes or sacred pools. These sacred lakes or pools allowed both the Hem Netjers (Priesthood) and the Shemsu (followers) to attend and perform their religious rites in a state of purity, which was of the utmost importance to the Egyptians. Ornamental trees were planted in front of temples, such as that of Hatshepsut (1573-1458 BC) . Entire groves of sycamores and tamarisk trees were found on the grounds of another temple. 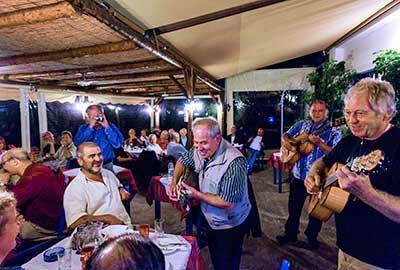 Tamarisks are as stubborn and hard to get and fierce as Cretans and have their stamina. First they drink a lot. When chopped down or burned, they simply send up new shoots. There are no known insect or disease enemies they have to fear. Leaves secrete salt which prevents insects and animals from parasiting and feeding on tamarisks and raises the soil salinity above the tolerance of most other species. Tamarisks grow a dense leaf cover, shading out other species. A mature saltcedar plant can produce 600,000 seeds annually and can become more than 100 years old. 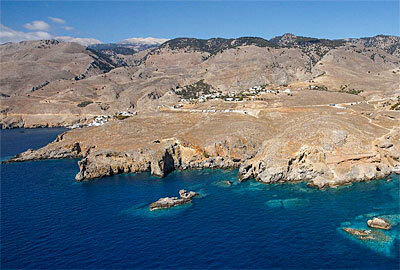 Really a nice metaphore of Crete! Ours is from 1965. Elevational range: Saltcedar/ Tamarisk occurs from below sea level to more than 7,000 feet (2,134 m) in elevation. 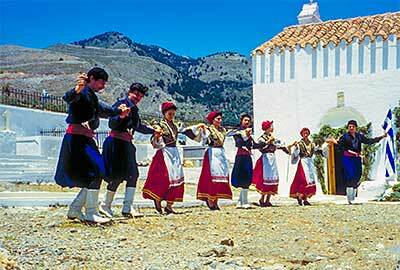 Cretans are fishermen and mountain people too.